For August of 2018, there are no townhomes for sale in VilaBella. In the past 12 months, 8 townhomes have sold with sales prices ranging from $150,000 up to $201,000 with an average sales price of $173,350 which equals $132.85 per sq. ft. of living area. These sales averaged 31 days on market before going under contract and sold at 96% of list price. Officially known as Vilabella Central Park Condos in Stuart FL this community is made up of 112 attached townhome style condos that were built in 2006. These homes range in size from 3 Bedroom, 3 Bath (two level) units with 1,607 sq. ft. of living area down to 2 Bedroom, 2 Bath townhomes with 1,072 sq. ft. of living area. All Vilabella townhomes come with a single car garage. There is also a community pool for the residents’ enjoyment. 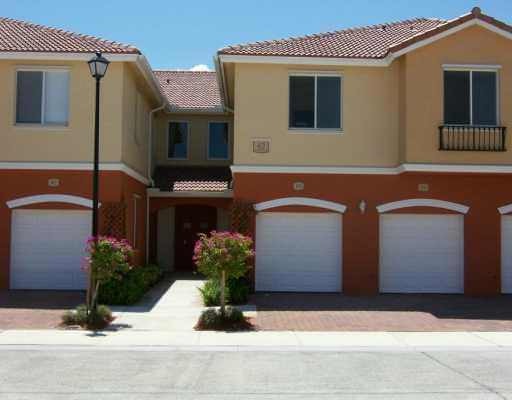 Vilabella townhomes is very conveniently located off SE Central Parkway with easy access to Kanner Highway as well as US-1. Very easy access to shopping, restaurants and downtown Stuart. Also, an excellent location for those wishing to access I-95 and commute to points both North and South. 2 large pets are permitted. The HOA fees are $216 a month (as of July 2018). Since these units are deeded as condos, these fees cover insurance and exterior maintenance as well as common area fees, management, cable TV, pest control, recreational facilities, etc.